ORION was a combination of random systematic happenings. The poem was originally written when I was living in Brighton in the early 2006. It got selected for publication within The Response; a literary magazine from the Factory Art Gallery. 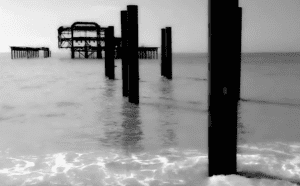 Then in 2016 I went to visit an old friend in Brighton, and got to record the footage of the burnt pier in Brighton and some images from the clock tower at Preston Park in Brighton too. The initial opening image was the view of my bedroom at the time which overlooked the River Thames at the level of Iffley in Oxford. The original footage was in colour, but after exploring different colour effects I finally decided for the elegant black and white of the final piece. As a background, I used a wave’s sound piece from a collection of natural sounds. At the time I used an iTunes song. I recorded my voice reading the poem on a phone recorder (iphone 4s), I sent it to my email inbox, download it and upload it to the video editing program Power Director. This program is available on-line and is less than £50 and it´s very reliable. Ok so now I had the voice, the wave´s soundscape, and the text of the title initial page and credits at the end. These are made within a text tool in Power Director, under 2D title frame. There is option of 3D if you pay a little extra. With regards to the footage, all recordings where slowed in speed, and the first image was slowed down to the maximum so that I could cut it several times, and to each separate recording I enhanced the whiteness which you can see at the introduction when the same footage becomes brighter and brighter. The poem in itself is very personal and emotional, and the movement of the waves is inviting to the rhythm of the reading. ORION was projected in the Arnolfini in Bristol for an Anathema poetry reading event run by Hesterglock and Sad Press, in the summer of 2017.